This is the site of a Roman settlement, and large number of Roman finds have been recovered during fieldwalking, metal detecting and excavation. These include hundreds of Roman coins, fragments of pottery and metal finds including a cauldron or bucket mount in the shape of an ox's head and a lovely example of a Dragonesque brooch with enamel decoration. Part of the site was excavated in 1952 and a flint-lined well and the remains of a square building with flint walls were discovered. This may also be the site of the deserted medieval village of Narford, which is mentioned in the Domesday Book. There were nearly one hundred houses in the mid 15th century but by 1805 only two houses remained. Iron Age, Early, Middle and Late Saxon, medieval and post-medieval coins, pottery and metal finds have also been recovered from the site during fieldwalking and metal detecting between 1980 and 2012. Possible site of Narford deserted village. Roman pottery, both from surface and excavation. Roman sherds and Neolithic flint. Excavation of Roman well containing organic material. Roman buildings located, Late Saxon and medieval pottery found. See drawings (S2) (S3) (S4) (S5) (S6) and (S7). The Norwich Castle Museum holds a number of Roman pottery sherds from this site that were found by  in 1952 (NWHCM : 1952.141). According to (S20) this collection also includes a prehistoric flint core. Although originally recorded as Neolithic this is probably the ?Mesolithic flint core from Narford that was identified by R. Jacobi and described in (S21) (which lists this accession number). 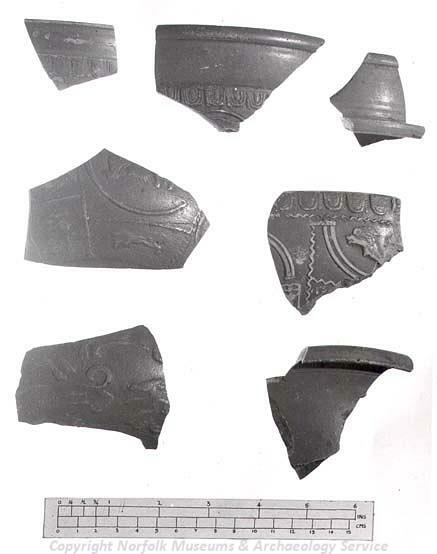 Roman, Early Saxon and Late Saxon sherds found. Palaeolithic flint tools and prehistoric pot boilers recovered. These Palaeolithic objects are now recorded as NHER 58857. P. Watkins (HES), 4 June 2013. Report of Iron Age torc and coins. Iron Age and medieval sherds. See full details, correspondence, drawings and site plans in file. 1996 to 2000. Metal detecting. 350 Roman coins, 6 medieval coins, 1 post medieval token. Iron Age, Roman, medieval, post medieval and undated metal finds. NB. Roman coins on 22 separate sheets. A. Rogerson (NLA), 27 April 2000. January 2000. Metal detecting. West end of site. A. Rogerson (NLA), 7 March 2000. 350 Roman coins, 2 medieval and 1 post medieval coins. Roman, ?Middle Saxon, medieval, post medieval and undated metal finds. A. Rogerson (NLA), 5 June 2000. ?Mesolithic/Neolithic flint axe. See file for sketch and full description by P. Robins (NCM) (S10). 1 Iron Age and 159 Roman coins. Roman, medieval, post medieval and undated metal finds. A. Rogerson (NLA), 29 June 2000. 1 Iron Age, 148 Roman and 1 medieval coins. Roman, medieval, post medieval and U metal finds. A. Rogerson (NLA), 24 July 2000. 4 Roman silver objects disclaimed as treasure. See additional description by  in file. A. Rogerson (NLA), 1 September 2000. 23 Roman coins from 2 areas. Medieval (S11) and undated metal finds. A. Rogerson (NLA), 4 March 2001. Roman finds inc. bracelet (POL), spoon, brooch, ?binding and chain (POL). Medieval buckle, strap loop etc. Post medieval cloth seal (POL). A. Rogerson (NLA), 7 January 2002. 4-10 October 2001. Metal detecting. 157 Roman coins, Roman dodecahedron, spoon, studs, Medieval strap end, ring, box mount, post medieval pin, mount and undatable ail, binding strip (?) and unidentified iron object. A. Rogerson (NLA), 1 April 2002. 16 to 18 March 2002. Metal detecting. 4 medieval metal objects, (S12). 70 coins found and identified by finder. A. Rogerson (NLA), 30 May 2002. 18 March 2002. Metal detecting. Iron Age Iceni silver coin. Roman 4th century silver coin. Roman or Early Saxon brooch fragment and undated stud. September 2002. Metal detecting. In area centred at . March - April 2003. Metal detecting. 135 Roman, 1 Late Saxon, 3 medieval and 1 post medieval coin. Roman, Late Saxon, medieval and post medieval metal objects. See lists divided into areas and dates of finding (n.b. 13 Roman coin sheets and 8 post Roman coin sheets). March - May 2003. Metal detecting. 1 Iron Age, 217 Roman and 6 medieval coins. Roman, Middle Saxon, medieval, post medieval and U metal objects. 29 Roman, 1 medieval and 1 post medieval coin. September - October 2003. Metal detecting. 2 Iron Age, 262 Roman and 1 medieval coins. Roman, Middle Saxon, Late Saxon (S13), medieval, post medieval and U metal finds. A. Rogerson (NLA), 10 November 2003. June - July 2004. Metal detecting. E. Darch (NLA), 11 August 2004. September - October 2004. Metal detecting in four areas. A. Rogerson (NLA), 8 November 2004. January 2005. Metal detecting in area centred . Medieval, post medieval and undatable metal objects. March - April 2005. Metal detecting. Roman, medieval and post medieval metal objects. A. Rogerson (NLA), 9 May 2005. February - March 2005. Metal detecting. In two areas 2 and 9 Roman coins, and 1 medieval coin. A. Rogerson (NLA), 8 April 2005. 1 Roman and 2 medieval metal objects. A. Rogerson (NLA), 11 June 2005. May - June 2005. Metal detecting. Roman, medieval and undatable metal objects. October - November 2005. Metal detecting. 139 Roman and 3 medieval coins. Late Saxon, medieval and post medieval metal objects. Two Roman coins and two Roman metal objects. A. Rogerson (NLA), 6 April 2006. Before 2 November 2007. Metal detecting. 20 Roman and 1 post medieval coin, Iron Age, Early Saxon, Middle Saxon/LS and Late Saxon metal objects (S14), and post medieval jetton. A. Rogerson (NLA), 1 February 2008. Before 18 December 2007. Metal detecting in six areas. 1 Iron Age, 806 Roman, 4 medieval and 3 post medieval coins, Roman, Roman/Early Saxon, Early Saxon, Middle Saxon, Middle Saxon/Late Saxon, medieval, medieval/post medieval, post medieval and undatable metal objects, Roman sherds, Roman vessel glass. A. Rogerson (NLA), 4 July 2008. Before 11 February 08. Metal detecting in Areas G,H & I. 1 Iron Age, 357 Roman, 4 Medieval & 2 post-medieval coins, 1 post-medieval jetton, Bronze Age, Early Bronze Age , Roman/Early Saxon, Early Saxon, Middle Saxon, Middle Saxon /Late Saxon, Late Saxon, Medieval & post-medieval metal objects. see lists, map copy & X-ray in file. A. Rogerson (NLA) 19 February 2009. Before December 2008. Metal detecting. 484 Roman coins and possible coin blank, 1 medieval and 1 post-medieval coins; Late Bronze Age (S18), Iron Age, Roman, Early Saxon (S16 and S17), Middle Saxon/Late Saxon, medieval, post-medieval and undatable metal objects. A. Rogerson (NLA), 20 May 2010. Before October 2009. Metal detecting. Roman finger-ring and Roman sword scabbard chape. A. Rogerson (HES), 27 June 2012. Before April 2010. Metal detecting. Thirty-eight Roman and two medieval coins, Late Bronze Age (S19), Iron Age/Roman and Roman metal objects. A magnetometry survey was undertaken here between 2011 and 2012 by . --- Aerial Photograph: TF7614 A-Y,AA-AF. --- Archive: Ordnance Survey Staff. 1933-1979?. Ordnance Survey Record Cards. TF 71 SE 13 . --- Newspaper Article: Eastern Daily Press. 1991. Roman coins discovered after night-time chase.. 23 July. --- Newspaper Article: Eastern Daily Press. 1991. Arrested men were 'lost'.. 24 July. --- Newspaper Article: Eastern Daily Press. 1991. Verdict due in Roman coins case.. 25 July. --- Newspaper Article: Eastern Daily Press. 1991. Four cleared over Roman coins.. 26 July. --- Illustration: 2008. NX 6437. Unidentified object found by S. Brown, Area H, Narford. --- Photograph: JHX 33-36, Medieval seal matrix Robert de Docking..
--- Article in Serial: Marsden, A.. 2009. Roman intaglios and sealings from Norfolk, 2002-2008.. Norfolk Archaeology. XLV, pp 529-38. --- Photograph: 2000. KST 30, Iron Age enamelled terminal..
--- Photograph: 2000. KST 29, Early Saxon cruciform brooch..
--- Photograph: 2000. KST 27-28, Early Saxon annular brooch..
--- Photograph: 2003. KTX 29-30, Romano British pin..
--- Photograph: 2003. KTY 2-3, Late Saxon disc brooch..
--- Photograph: 2000. KVH 32, Romano British coin mould..
--- Archive: Clarke, R. R. and NCM Staff. 1933-1973. Norwich Castle Museum Record Card - Roman. Narford. --- Archive: Clarke, R. R. and NCM Staff. 1933-1973. Norwich Castle Museum Record Card - Medieval. Narford. <S1> Article in Serial: Thomson, F. H. 1958. A Romano-British Pottery Kiln at North Hykeham, Lincolnshire: with an Appendix on the typology, dating and distribution of 'Rustic' Ware in Great Britain. Antiquaries Journal. Vol XXXVIII Nos 1 and 2 pp 15-51. p 51. <S2> Illustration: Unknown. 1952. 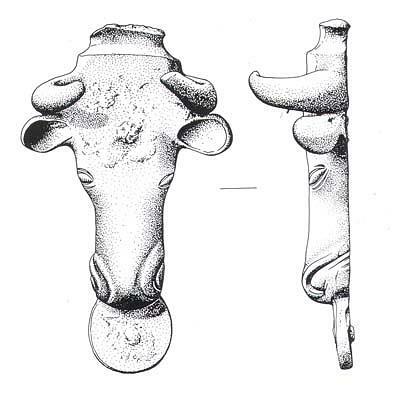 Drawing of a Roman iron fitting.. Card. 1:1. <S3> Illustration: Unknown. 1952. Drawing of a organic material from a Roman well.. Card. 1:1. <S4> Illustration: Unknown. 1952. Drawing of a organic material from a Roman well.. Card. 1:1. <S5> Illustration: Unknown. 1952. Drawing of a organic material from a Roman well.. Card. 1:1. <S6> Illustration: Unknown. 1952. Drawing of Roman knives.. Card. 1:1. <S7> Illustration: Unknown. 1952. Drawing of a Roman spindle whorl.. Card. 1:1. <S8> Illustration: White, S.. 1996. Drawing of a Roman cauldron/bucket mount in the shape of an ox.. Film. 2:1. <S9> Illustration: Rogerson, A.. 2000. Drawing of a Bronze Age awl.. Film. 1:1. <S10> Illustration: Robins, P.. 2000. Drawing of a Neolithic flaked axe.. Paper. 1:1. <S11> Illustration: Hoyle, M.. 2001. Drawing of a Roman horse harness mount.. Film. 2:1. <S12> Illustration: Ashley, S.. 2002. Drawing of a medieval horse harness pendant.. Film. 2:1. <S13> Illustration: Unknown. 2003. 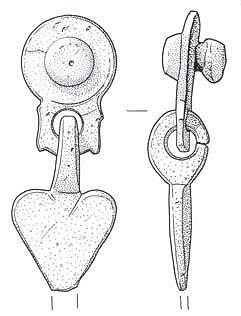 Drawing of a Late Saxon stirrup terminal.. Film. 2:1. <S14> Illustration: Gibbons, J.. 2008. Drawing of a Late Saxon buckle plate.. Film. 2:1. <S15> Illustration: Gibbons, J.. 2008. Drawing of a Roman seal box lid.. Film. 2:1. <S16> Illustration: Gibbons, J.. 2009. Drawing of an Early Saxon Kentish silver jewelled disc brooch fragment.. Film. 2:1. <S17> Illustration: Gibbons, J.. 2009. Drawing of an Early Saxon Kentish silver jewelled disc brooch reconstruction.. Film. 2:1. <S18> Illustration: Gibbons, J.. 2009. Drawing of a Late Bronze Age knife fragment.. Film. 1:1. <S19> Illustration: Gibbons, J.. 2011. Drawing of a Late Bronze Age awl.. Film. 1:1. <S20> Archive: Clarke, R. R. and NCM Staff. 1933-1973. Norwich Castle Museum Record Card - Neolithic. Narford. <S21> Archive: R. Jacobi. -. Jacobi Archive. 10305.